Massage your feet with soap or lotion made from this plastic mold. We recommend watching our video on removing soap from plastic molds as this mold can be tricky without the right knowledge. Bar Dimensions: 3" x 2.25" x 0.75"
Now you can massage your skin while bathing! 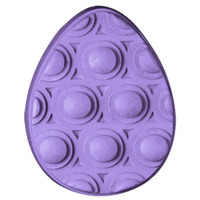 The Massage Egg Soap Mold has raised, rounded nubs that deliver an invigorating, soapy experience while you wash. It's like going to a spa without leaving your home. Bar Depth: 1.125" Bar Length: 3.75"